In a city renowned for its exquisite architecture, the narrow houses that line Amsterdam’s canals are among some of the most memorable examples. Three of these stand out as the narrowest of them all. Measuring slightly more than two metres across, residents can almost reach out and touch both walls from one spot. Climb the narrow staircase to see the tiny rooms in the narrowest house in Amsterdam. Compare the widest house in Amsterdam with one of the narrowest on the Kloveniersburgwal. Venture down the narrowest street located in the Red Light District. Amsterdam’s oldest houses, with their ornate gabled façades, are a national treasure. Many of these stunning examples of architecture, found around the city’s Canal Ring, date back to the Dutch Golden Age when a building tax was calculated by the width of a property’s façade. 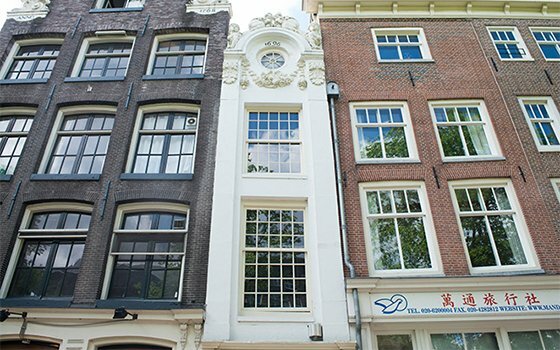 There is some debate about which houses are the narrowest in Amsterdam, and indeed the world, however, the most notable examples can be found at Singel 7, Oude Hoogstraat 22 and Kloveniersburgwal 26. The house typically referred to as the narrowest in Amsterdam was built around 1600 at Oude Hoogstraat. It stands at a minuscule 2.02 metres wide and only 5 metres deep, with just one small room on each floor, which must have made living in it extremely impractical. Today, the house is open to the public as ‘the smallest tea room in Amsterdam’. Its ground floor is a shop selling loose leaf teas and sweets, while the second floor is used for serving breakfast and high tea to very small groups of guests – reservations are essential. The walls are lined with photographs and illustrations that give you a glimpse into the house in its former days. The house at Singel 7 is unique in its structure, with a façade that is just over one metre wide. Standing between two much larger houses, it makes for a striking photograph, with arms outstretched in front of it. However, this is just the back of the house; the front is considerably wider. The Trippenhuis at Kloveniersburgwal 29 is the widest house in Amsterdam, which was built between 1660 and 1662 for brothers Lodewijk and Hendrick Trip. This palatial space even hosted the Rijksmuseum between 1816 and 1885, before it moved to its current location on Museumplein. However, its impressive neo-classical architecture mirrors that of an extremely narrow house across the street. As the story goes, the brothers commissioned the second house for their coachman after he remarked that he would be delighted with a house as wide as his masters’ front door. Amsterdam’s Trompettersteeg is another unusual example of narrow urban spaces. This skinny street in the Red Light District is just one metre wide yet packed with visitors and tour groups all year around. There are many more interesting properties to see in the city centre of Amsterdam. Some have elaborate gardens, terraces and coach houses hidden away from the street. During Amsterdam Heritage Days, held annually in September, you can peek inside a selection of the monuments, stately mansions and privately owned homes that are not otherwise open to the public.